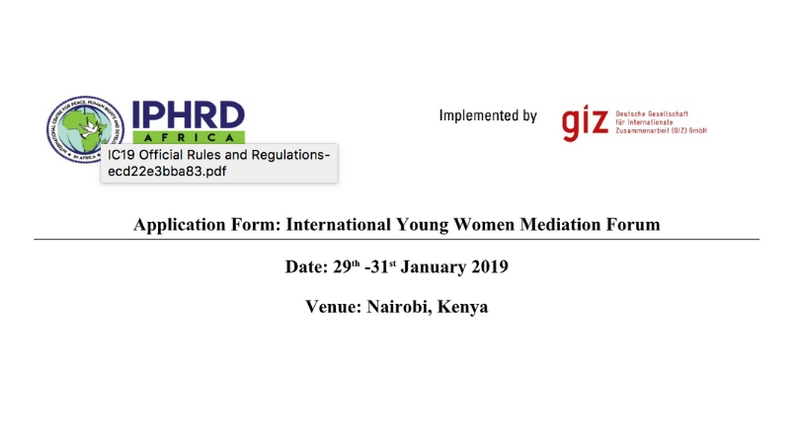 Apply to attend the International Young Women Mediation Forum held in Nairobi, Kenya on 29-31 Jan 2019. The Forum aims to bring together young women mediators to tackle the lack of representation of young women in mediation processes. The International Young Women Mediation Forum will bring together 23 young female mediators from Africa and Europe. Participants will include members of different women mediators’ networks such as FemWise-Africa, Women Mediators across the Commonwealth (WMC), and the Mediterranean Women Mediators Network (MWMN). The Forum aims to tackle the lack of representation of young women in mediation processes. The International Young Women Mediation Forum will be held by the International Centre for Peace, Human Rights and Development in Africa (IPHRD-Africa) and is supported by the Deutsche Gesellschaft für Internationale Zusammenarbeit GmbH (GIZ). To provide a platform for participants to share and learn from one another in a professional environment and with support from female mediation experts. To develop strategies to tackle the challenges faced by young women in mediation and thereby address the lack of representation of young women in the field of mediation. To gain further insight into the field of mediation through participation in practical mediation scenarios and case studies and thereby address the intergenerational gap in mediation. Travel to and accommodation in Nairobi will be covered by the organizers. Applicants should be between the age of 18-35. Applicants should have engaged in peace processes in one or more ways indicated in the application form (No.8). Applicants should be fluent in at least English or French. Applicants must have a demonstrable plan for how to utilize the skills, knowledge and learning gained from the Forum. Applicants should demonstrate ability to work in multicultural groups, and be respectful of diversity. Successful candidates must hold valid travel documents (passport and yellow fever card) prior to acceptance. A cover letter detailing your motivation and reason for interest in the Forum. Please outline your work on mediation. For more information, visit International Young Women Mediation Forum.